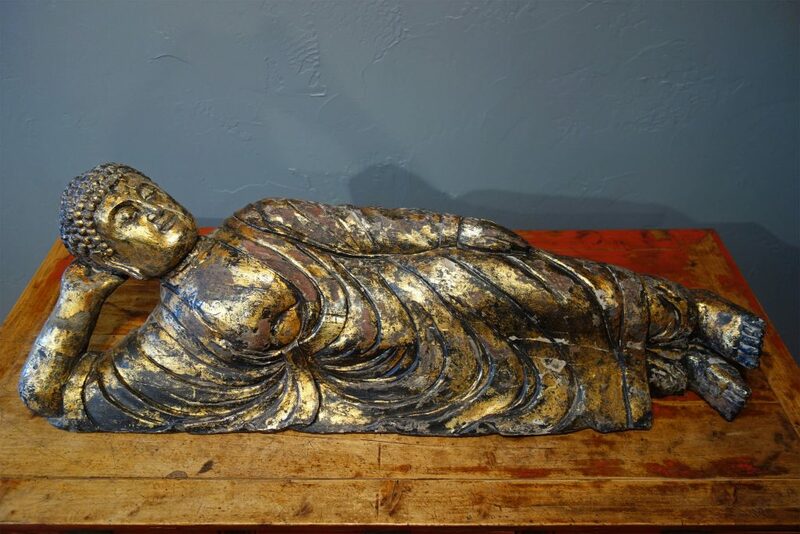 12” h. x 39” w. 10” d.
This figurine shows Buddha at the end of his life, at death, which means the passing beyond nirvana (liberation or enlightenment, or bodhi). The figurine was first painted with a layer of black mineral pigments, then a coat of red, and finally gilded. To decorate with so many coats is to honor him. In Buddhist countries, monks and special religious persons would “redress” the Buddha figure on special occasions such as celebrating the birthday of the Buddha. Non Buddhists are not supposed to polish the figure. It survived the ravage of time the way it is, displaying a great patina.